Tesla Company letterhead. 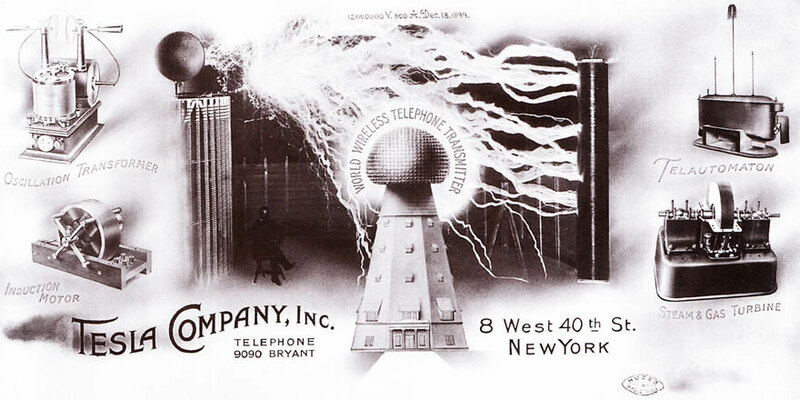 Note the words "World Wireless Telephone Transmitter. Welcome to the Teslaresearch website. This website has been created with the objective of gathering and organizing as much information as possible on Tesla's inventions and experiments, but also to compare his statements and predictions with the modern science and technology. The contents are created progressively and some sections and categories are unfinished or just empty. The most basic contents available are probably still unfinished and the most technical contents are also under construction but will not be available until they are ready. It wouldn't have been possible to create most part of the contents without the permission of some of the most important websites about Nikola Tesla. Feel free to offer any information or to colaborate with the contents but also to ask about any precise information. Thank you all for creating the great website!!! Genial. Esta página como todas las de su blog merecen la mayor alabanza. Siempre hay personas que dedican su esfuerzo a hacernos la vida más agradable a todos y, a compartir desinteresadamente su trabajo. Gracias desde España. Thank you for making this site .I have based a lot of my inventions using Tesla tech so it's nice to see a site dedicated to his research. This website is amazing with one of the most extended information regarding Tesla's life journey. I appreciate this cause to help spread Tesla's existence in form of words and pictures. Thank you for producing an easy navigable and comprehensive web-site; I am currently reading a book on Tesla, written by Margaret Chaney, and published in nineteen-eighty-one. I must say her research documentation is excellent, and compressive as your web-location. In one particular chapter, she quoted a statement from Lelend Anderson; I performed a web-search on Mr. Anderson, and that search led me here. People interested in the Tesla story are missing a huge RED flag. That is the confiscation by the police of his papers and the quickness with which this was done. Clearly Tesla was being watched. This type of act is only done to those who are considered very dangerous. It was the final chapter in the Tesla Einstein conflict. I hope that you will be able to complete this website, it’s the best I’ve seen. It not only offers clarity in Tesla’s work and patents but can be easily understood by anyone with an interest in this area. It is a great testimony to a great man. I have always been fascinated with link between electromagnetics / gravity and look forward to gaining further understanding of the principals and development of Tesla’s work. I seek knowledge of his research and want to understand electromagnetic energy and polarity. I have just started reading 'My inventions' and feel very lucky that i have come across this website. Looking forward to explore this with great excitement and curiosity. I am requesting to put all work as a book and publish.